New user? | Lost login? the Creative Commons Attribution 4.0 License. Abstract. Ultra-sensitive space-borne accelerometers on board of low Earth orbit (LEO) satellites are used to measure non-gravitational forces acting on the surface of these satellites. These forces consist of the Earth radiation pressure, the solar radiation pressure and the atmospheric drag, where the first two are caused by the radiation emitted from the Earth and the Sun, respectively, and the latter is related to the thermospheric density. On-board accelerometer measurements contain systematic errors, which need to be mitigated by applying a calibration before their use in gravity recovery or thermospheric neutral density estimations. Therefore, we improve, apply and compare three calibration procedures: (1) a multi-step numerical estimation approach, which is based on the numerical differentiation of the kinematic orbits of LEO satellites; (2) a calibration of accelerometer observations within the dynamic precise orbit determination procedure and (3) a comparison of observed to modeled forces acting on the surface of LEO satellites. Here, accelerometer measurements obtained by the Gravity Recovery And Climate Experiment (GRACE) are used. Time series of bias and scale factor derived from the three calibration procedures are found to be different in timescales of a few days to months. Results are more similar (statistically significant) when considering longer timescales, from which the results of approach (1) and (2) show better agreement to those of approach (3) during medium and high solar activity. Calibrated accelerometer observations are then applied to estimate thermospheric neutral densities. Differences between accelerometer-based density estimations and those from empirical neutral density models, e.g., NRLMSISE-00, are observed to be significant during quiet periods, on average 22% of the simulated densities (during low solar activity), and up to 28% during high solar activity. Therefore, daily corrections are estimated for neutral densities derived from NRLMSISE-00. 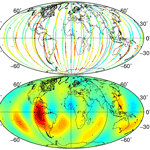 Our results indicate that these corrections improve model-based density simulations in order to provide density estimates at locations outside the vicinity of the GRACE satellites, in particular during the period of high solar/magnetic activity, e.g., during the St. Patrick's Day storm on 17 March 2015. How to cite: Vielberg, K., Forootan, E., Lück, C., Löcher, A., Kusche, J., and Börger, K.: Comparison of accelerometer data calibration methods used in thermospheric neutral density estimation, Ann. Geophys., 36, 761-779, https://doi.org/10.5194/angeo-36-761-2018, 2018. To predict the satellite's motion or its re-entry, the density surrounding the satellite needs to be known as precisely as possible. 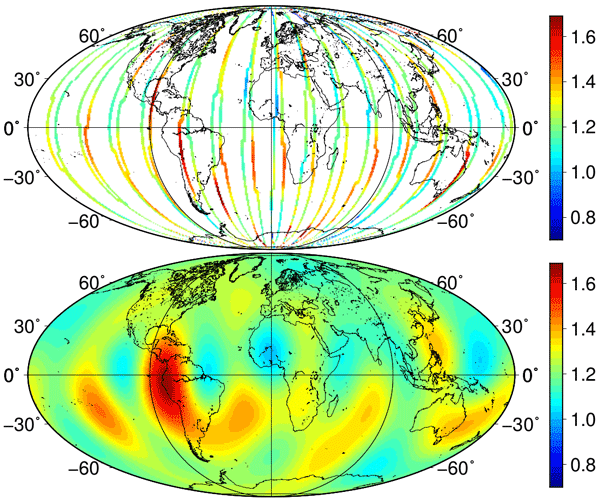 Usually empirical models are used to estimate the neutral density of the thermosphere, which is the region of the neutrally charged atmosphere. Here, based on calibrated accelerations measured by instruments on board satellites, we compute daily global maps to correct modeled densities. During times of high solar activity, corrections of up to 28 % are necessary.